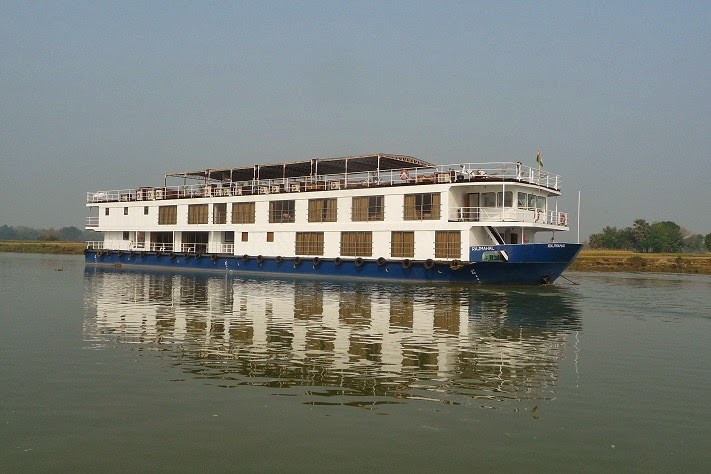 A modern, comprehensively equipped river cruise vessel operating on the Ganges and Hooghly Rivers in West Bengal, India. Cabins: 22. 18 convertible twin cabins. Four single cabins. All a/c. Other: Spa, dining room, saloon/lounge/library, full length sun deck. Dining is typically buffet selections of predominantly Indian cuisine. Shore excursions are a combination of local boat transfers and vehicle tours by local taxi. An experienced guide accompanies each cruise. Water is filtered on board for use in bathrooms. Bottled water is supplied daily for drinking. Medical: ship carries first aid only. All guests should carry insurance. Internet: Limited WiFi depending on local mobile coverage.